Well hello, I'm back! Trying to blog (or trying to do anything!) became so frustrating on my old laptop that it really wasn't worth all the stress. At one point it was taking me fifteen minutes to load a web page so sadly blogging was off the cards. I really didn't want to lose my hair over it so it had to go. It also meant that editing photos was a nightmare as I couldn't open more than one program at once. Some Birthday money (yep, I had a Birthday, you all missed that too I'm afraid- I was going to do a special pattern release but alas no) has meant a brand spanking new laptop and my landlady has kindly sorted the internet so all is go! Life for me at the moment is work work and more work. I also have exams in 6 weeks time so am working a couple of extra hours a day to revise. Whilst I have the best of intentions of keeping up with my blog if things slip you know why. 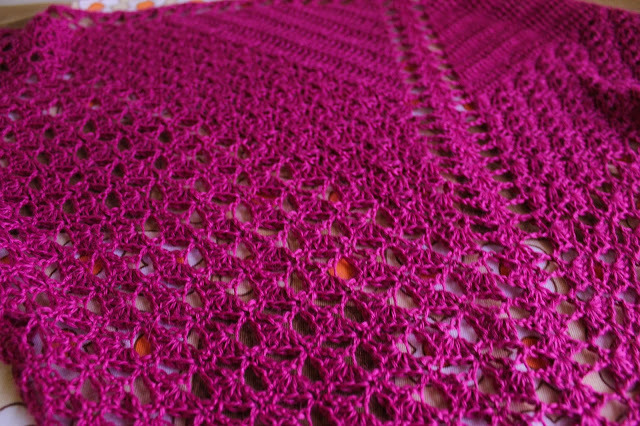 The beautiful Transposition Shawl by Joanne Scrace for the Crochet Project. 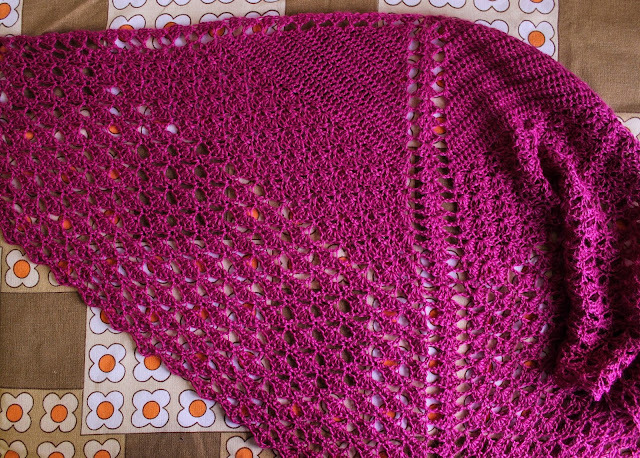 I crocheted this in Artesano Silk Alpaca 4ply that I picked up in the sale. This colour is cyclamen. I also picked up a couple of skeins of Signal Blue which I will be using to crochet up Cherry Pi later this month. This was a quick little number that I made for my sister to give as a gift to one of her friends who has just had a little girl. Apparantly she also got a little duffel coat which would go perfectly. 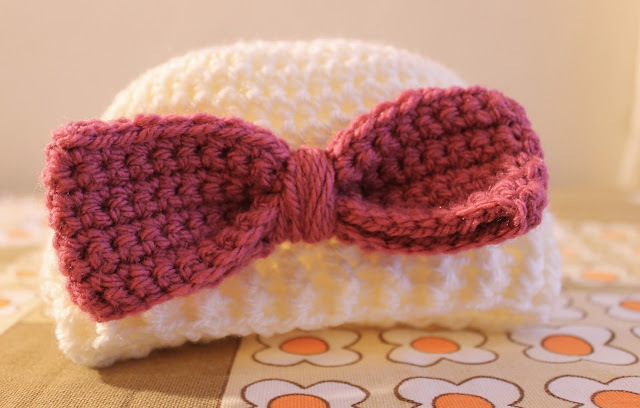 Whilst I was crocheting this I was a bit worried that the bow would be massive, and yes, it does look pretty massive in photos, but when on it looks much more in proportion. I feel a bit bad about this as it was for my Dad for Christmas and I only finished it a couple of weeks ago. As you can see its knitted. I think I just wanted to remind myself that I could still knit, and whilst I found out that I definitely still can it reminded of why I love crochet so much- the speed. I'm sure if I had been crocheting this scarf it would have been finished by Christmas. Despite the amount of time it took I really quite liked it in the end. This as going to be my special Birthday treat pattern but as it was for my Dad I may actually write it up for Father's Day (someone remind me please!). Since Christmas I feel that I may have taken a funny turn, I seem to be in the mindset of finishing something before I start something else. Its very unlike me but its working- I feel less stressed as my brain is only working on one (or two) things at a time, plus my room/flat feels a little less cluttered as I don't have project bags coming out of my ears! It actually feels quite good to be tying up some loose ends.